Hey all! Here I am, again. Well, I am in the groove coloring sparkling all that I come across. Did you notice? HAHAH. I came across a few challenges this week that interested me and I thought I had the right stuff to participate. I will list them at the end of the post...Challenges are super cool because it gives a chance for you to meet all kinds of crafters and learn lots of cool techniques. Talking about that...this week a new challenge will poop at Magnolia Stamp lovers! So come in and join us...the prizes are always so goooood. Feel free to ask questions! Just give a shout out on the side box :). Grab a marker and go have some fun! Challenges : Mojo monday123, Copic creations, Copic color, Spoon full of sugar, Color Combo, Double Dutch, My time to craft and Pile it on. Brrrr!!! It is freezing outside.. I was inspired by a nice snow promise today. I hope we gets a lot of it snow, no ice please ( I hate when it is cold an nothing pretty to see..:) Well to keeps the winter spirits high, I prepared this magnolia card. I will tell you I am having such a ball coloring these magnolias stamps! I am a fan of maggies because its images can serve a ton of propose, my card is a thank you note, but I can easy see this same image as "thinking of you". Guess what? I hopped in the easel card wagon! They are so fun to make.. I like this style because gives me a little extra embellishment in the card. I hope this card will inspire you to get your markers and stamps and have some fun and to send a note to that dear person! Excuse me now I am going to make a wish list with Cindy....she just came back from CHA 2010....ay! ¤ Embossing & Die cuts: labels die cute, swiss dot Cuttle bug embossing folder, Nestabilities, impressabilies. ¤ Paper: Ciardstock and DCWv. ¤ ALL materials listed can be found at stampingscrapping.com . Cindy just came back from CHA 2010. LOADS of new goodies are being uploaded daily!! If you are " I need that now" kind of person like me. Cindy is your fairy - shippingis lightening fast!!! Visit us also at Magnolia stamp lovers...there is always a gift to grab! Hello everyone! I always have a lot of fun preparing cards for Magnolia Stamp Lovers. It is easy when you have so many great people inspiring you. This Challenge #2 was prepared by Stephanie, a lovely sketch. Since we are getting very close to Valentine's day, I decided to make a card with a love vibe! Can you hear Barry White song in the backgroud??? The Magnolia xstitch, which by the way is the cutest thing, was my chosen image. The good thing about Maggies is that so many of the images can be part of a LOVE card (take a peak). I also need to add that is my first time using the i-top! I will tell you the tool if soooo cool! HA Life will be easier now, since the i-top make matching easy breeeeeze!!! Okay sorry, but I have to do the dance here. I just love to make my stuff from scratch and this baby does help me doing that. Have you joined us at the Challenge #2? NO ? Are you serious? HURRY!!! The prize is no less than 1 YEAR, yes I said 1 YEAR of Magnolia INK magazine. This magazine is one HOT commodity!!!!! Thanks for stopping by and please drop a note and follow me! I am thinking to have a Candy...my birthday is coming and I need to celebrate....So leave a message and tell me..Candy or no Candy? Also tell me what type of Candy you like! I need at least 51 comments and extra followers (61 total) to make statistical sense and really really worth it..hehehhe. OH MY Have you heard that CINDY (from stampscrapping.com) will be loading, I mean LOADING (not kidding) the store with a TON of new maggies? I am not joking! She will be back from CHA winter 2010 by the end of this week full of Maggies for all of us!!!! Aside from a TON of other goodies! ¤ Markers & Pens: Copics E00, E35, E02, E37, B000, BG000, BG10, Y28, YR01,Rv00,RV11, RV06, R20, T1, (0). White Inkessentials pen. ¤ Ink & stamps: Memento Rich Cocoa; Versa Magic. Valentine LOVE stamp. ¤ Embellishments: : Glitter, Robin's nest, i-top brads, ribbon. Pearls; Rhinestones. ¤ Embossing & Die cuts: Nestabilities oval classic. ¤ Tools: i-top; Sizzix, . Magnolia stamp :: Baby it is cold outside! Yeah baby! It is freeeezing outside. We have been under one of the coldest winter in 20 years! HA! I will not get into it. Don't try me...the scientist will pop up and you will see some passion here. : ). My geology (yes geology) classes were worth something! I loved them..so watch out! 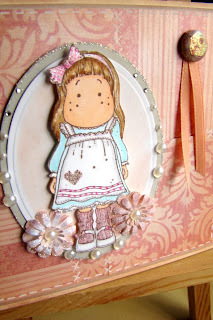 Anyway, this week I had the opportunity to participate at a Challenge over Magnolia Stamps Lovers (MSL). The lovely sketch from Mindy brought me an instant idea...including pimping up a bit a magnolia stamp. Well it is all about new year and thinking outside of the box. I turned the sketch upside down and triked things a bit ( witch here..nah: ) like using texture giving the image more dimension. See! That one stamp you got, can have a bazillion ways of make it up. So go ahead a get that stamp that you " need "! You bet now I will be needing a whole magnolia collection!!. My idea was to see the Magnolia coming from outside into her little house with a cheery sunflower to spook the cold! I had fun trying to make a cool door (with window glass on it and handle!). How about that wall paper...would you like me to decorate your space?..HAHHA. I will bring the cocoa! ¤ Embellishments: Tinsel Glitter, Ribbon, Microbeads, Rhinestone, Dew drops, Twinkle Jewels, cellophane..
¤ Tools: Score pal, Scissors, glues. ¤ Don;t forget to get your materials! Make it! Check Cindy store! You will have your stuff before you say...I want that!